MY acquaintance with the fabled jewels of the Nizams of Hyderabad goes back to some 20 years ago. It dates in fact to the time when I had been designated as Director of the National Museum in Delhi— it is another matter that I never took the offer up — and was, in consequence of that, made a member of a committee the Government of India had set up to "examine the Nizam's jewels". The committee was to hold its meetings in Bombay, for that is where the jewels at that point were, and its task was to decide whether any of those treasures came within the purview of the Antiquities and Art Treasures Act. 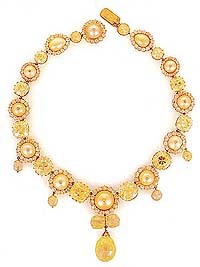 The jewels were still in the possession of the Trusts that the late Nizam had set up, and one of the Trusts had applied to the Government for permission to export some of the objects: That is where the Act came in. In the nature of things, all precious stones and metals would come within the purview of the Act— for, by definition, they are more than a hundred years old, the limit set by the law for the purpose of declaring an object an antiquity - but the antiquity of jewellery is to be decided taking other criteria, like workmanship and the date of making etc., into account. It is a little complicated to explain all this here, and I do not wish to take anyone into those winding legal lanes. Suffice it to say that there was an occasion, and I was part of it. The committee, as I said, was to meet in Mumbai, apart from the representatives of the Department of Culture, there were on it officers of the Archaeological Survey of India, and some renowned jewellers who had been co-opted - and the jewels were to be examined in the vaults of one of the big banks there in which they had been kept by the Trust for obvious reasons of safety. There, then, we sat, around a table, in those gloomy, catacomb like surroundings, for hours on end each day, while the responsible officers of the Trust, assisted by bank official, kept bringing out of the strong rooms, in a steady stream, box after precious box of the most dazzling objects for our examination. I know very little about jewellery and precious stones but, like others, I sat there fascinated, gazing at things that very few outside the guarded palace rooms of the Nizams and their zenanas had seen. It is difficult for me to recall with precision any single object that I saw then, but the general impression that the objects made on me and others has lingered with me all these years: Emeralds the size of pigeon's eggs, diamonds most delicately cut and set, pearls from Basra whose lustre took your breath away, mina-work of unmatched refinement. Each time an object was brought in, and placed on the table for us to examine, the room seemed to light up, as it were. This lasted for full three days as I recall, and, at the end of it, we were in some kind of a daze: exhausted, but singularly aware of having been part of something truly unusual. What decisions the committee took eventually is not of relevance here. And, as far as the collection is concerned, much happened afterwards. The Nizam's jewels became the subject of a long and complicated legal wrangle; determined efforts were made to keep them in India, and acquire them for the nation; most of the energy spent on all this bore fruit. The result is that not everything, but a substantial part, is now in the National Museum in Delhi, and went up, at long last, on display last month. "Nizam's Jewellery: A Legendary Collection" is how the Delhi exhibition — now about to wind up, before it moves on to Hyderabad, the city to which it is umbilically tied — was called. It was wonderful to see the treasures displayed: The sarpech and kalghi ornaments meant for the turban, made up of dazzling diamonds and rubies and pendant emeralds; the multi-stringed necklaces strung with pearls of lustrous hue; ruby-and-emerald-and-gold bracelets; diamond-studded paizeb-anklets; sarpattis and finger-rings and bazubands; even the fabled Jacob Diamond of 184.5 carats which, according to legend, the late Nizam used to keep on his work-table as a paper weight. As I said, it was wonderful to see the treasures; but equally wonderful it was to see the crowds lining up to see the show. Possibly for the first time since the Padshahnama exhibition, which goes back a few years now, the galleries of the Museum were crowded. There was a fairly expensive entry ticket, but this did not keep anyone from coming. In fact, so large has been the visitorship that tickets had to be issued for specific timings, and all that a visitor was allowed to spend in the gallery was something like half an hour. It is clear that it was not any kind of connoisseurship but the sheer glamour of the collection, the thrall in which jewellery holds most of us Indians in any case, which was bringing the crowds in. One could see whole families in awed silence, in that darkened and discreetly-lit gallery, moving starry-eyed from showcase to showcase, pointing things out to one another, stopping sometimes to read a label, sometimes to gaze at the mystifying finger-ring whose alexanderite stone naturally changes colour as the light around it changes. But whatever it was, whatever the levels of energy, it was an agreeable sight to see the Museum become the focus of something in peoples' eyes. Some visitors and journalists have gone into print about the lapses and the lacunae in the display, or in the text panels and other information meant to be shared with the public. But that, and the contents of the show, are things to which I might return another time. Meanwhile, one notices that there was no real catalogue or book which was readied in time— it is due to be published later, one learns for the show: Something that I deem to be unfair to the interested visitor. All that one could lay one's hands on was a little booklet, with some reproductions and some information on individual objects. But even here it was curious to see objects captioned in a manner that hardly anyone would understand: the descriptions were obviously taken from the Persianised-Urdu or Dakhani entries from the Nizam's original inventory registers. Thus, what would any visitor today understand if an object is listed as Paizeb yakoot wa almas wa zamurrud, or as Kanthi marvareed? All I can do is to offer some help by translating. Yakoot is ruby; almas, diamond; zamurrud, emerald; and marvareed, pearls.